Switch things up on meatloaf night with this Porchetta Meatloaf. It also makes a great sandwich the next day! Combine all ingredients, mix well and spread out on a well oiled sheet of parchment paper. Chill while you prepare the bacon layer. Combine all ingredients in food processor and process until fine, but not pureed. Preheat oven to 400 F. Spread bacon layer on top of pork and roll up with the long end closest to you using the parchment paper as support, peeling it back as the roll tightens. 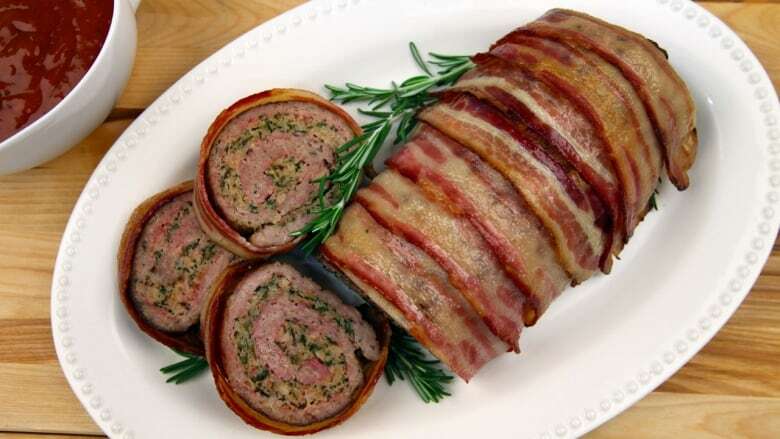 When fully rolled, tuck the ends under and place bacon strips on the meatloaf, tucking the ends under the loaf. Bake until loaf is cooked to internal temperature of 180F and bacon is golden and crispy, 35-40 minutes. Let meatloaf rest for 10 minutes before slicing. Combine all ingredients in a sauce pan and whisk together until smooth. Bring to a boil over medium heat and cook until reduced and thickened.